LINCOLN CITY, Oregon, February 18, 2013 (ENS) – Japanese environmentalists concerned about marine debris scattered across the Pacific by the March 2011 earthquake and tsunami came to Lincoln City on the weekend to coordinate with Oregon residents and help clean Oregon beaches. As if to greet them, a barnacle-encrusted, battered fishing boat from Japan washed up on the Oregon shore five miles to the south just a few days before the Japanese delegation arrived. After Oregon Department of Fish and Wildlife scientists examined it for invasive species, the one-ton boat was hauled to a local landfill. 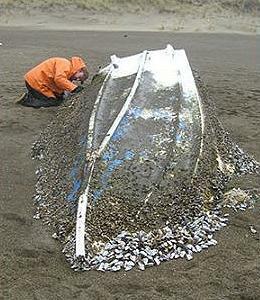 Tsunami debris began showing up on beaches in Hawaii and from Alaska to California last year. Two large docks have washed ashore, one last August in Oregon about 20 miles south of Lincoln City, and the other on Washington’s Olympic Peninsula last December. Many smaller pieces of debris from squid fishing lights to bits of plastic have made their way across the ocean. The Japanese visitors and their Oregon counterparts held a beach cleanup Friday in the resort town of Lincoln City and a day-long Marine Debris Public Workshop Saturday that drew state and local officials and cleanup volunteers of all ages. Oregon First Lady Cylvia Hayes welcomed the Japanese group and said their visit is important to her and to the people of Oregon. Hayes is founder and CEO of 3EStrategies, an environmental consulting firm. In the role of First Lady, she and “life partner” Governor John Kitzhaber have done several trade missions to Japan. Over the next year or two, an even greater wave of tsunami debris is expected to wash up on the Oregon coast. Speaking at the workshop, Junichiro Noguchi, a technical official from Japan’s Ministry of the Environment, said about five million tons of debris entered the ocean after the tsunami. Some 3.5 million tons of that debris has settled into the sea bed near Japan, while the remaining 1.5 million tons is drifting in the ocean. 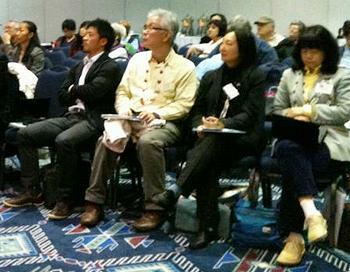 The Japan Environmental Action Network, a nongovernmental organization, coordinated the visit to Oregon. 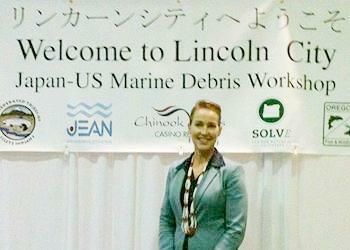 Through this visit, JEAN and the other participating Japanese organizations want to share information about their disaster recovery efforts with U.S. audiences and do research on the tsunami debris showing up on North American shores. JEAN’s Azysa Jihuna said since 1990 the group has been working to solve the marine litter problem by providing information to the national government and Japanese society. To help solve the ocean’s garbage problem, we appeal to the public in the spring and fall to take part in coastal cleanup activities, Jihuna said. General Mike Caldwell, director of Oregon’s Office of Emergency Management, heads the Oregon Tsunami Debris Task Force, charged with incident preparedness and response, public safety, cleanup, and public outreach to address marine debris affecting Oregon’s coastline. The task force includes representatives of State Police, Parks, Environmental Quality, Fish and Wildlife, Public Health, Transportation and the Marine Board, as well as local and tribal governments, state legislators, community organizations, and federal agencies. The task force has partnered with 211info, a nonprofit phone hotline, to expand coverage for coastal communities to get information on and report issues related to marine debris. People can dial 2-1-1 and can also call 1-800-SAFE-NET (1-800-723-3638) to access resources and information.